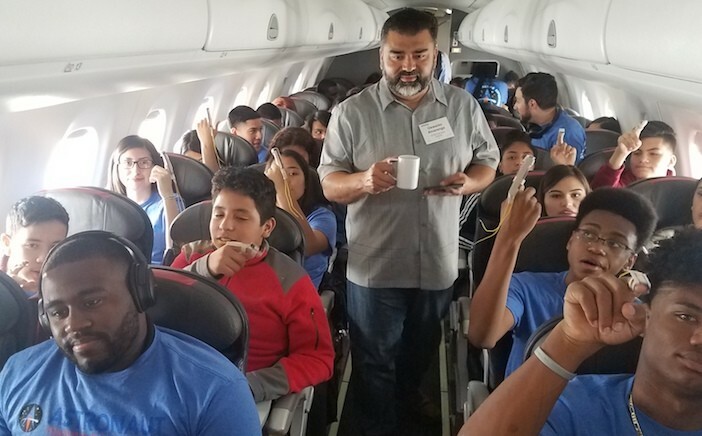 Forty Dallas ISD students and a handful of teachers/chaperones flew to the Kennedy Space Center in Florida last month on a private charter airplane as part of the “STEM-Liner Experience,” which gave them incredible hands-on experience with Science, Technology, Engineering and Math instruction. The students came from W.H. Adamson High School, Barack Obama Male Leadership Academy, Irma Lerma Rangel Young Women’s Leadership School, and South Oak Cliff High School. They were handpicked by their principals for the trip. Crystal Alexander, a manager in the Dallas ISD STEM Department and one of the chaperones, kept a running log of their amazing adventure. We attend a banquet and tour the charter plane we will fly in the next day. Students pose in front of the charter plane they will fly in the following day. We also hear an inspiring speech from Gary Littrell, a Medal of Honor recipient. He talks about how ethics is the foundation for all study, especially for the STEM fields, since the students have a huge social responsibility to use those fields for good. Medal of Honor recipient Gary Littrell inspires students with a speech. We wake up at 4 a.m. to get to the airport an hour later. The flight leaves at 6:15 a.m., and it’s the first time many of the students have flown on an airplane. We are pretty tired, but excited! Students fly on the chartered airplane from Texas to Florida. Two-and-a-half hours later, we make history by being on the first commercial airplane to land on the NASA landing strip in Florida. Selfies ensue. Students and chaperones document their landing in Florida with photos. 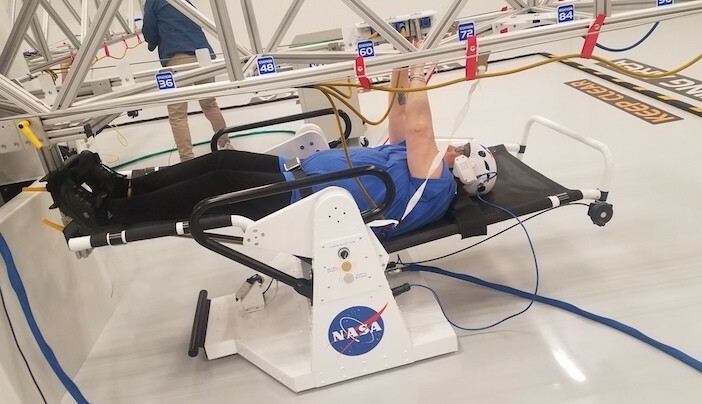 Students get right to work with a simulation of driving on Mars and flying in space, working as teams to succeed. Students see how food is grown and packaged to take into space. They plants seeds, take it through the processor, and even (reluctantly) taste the food. 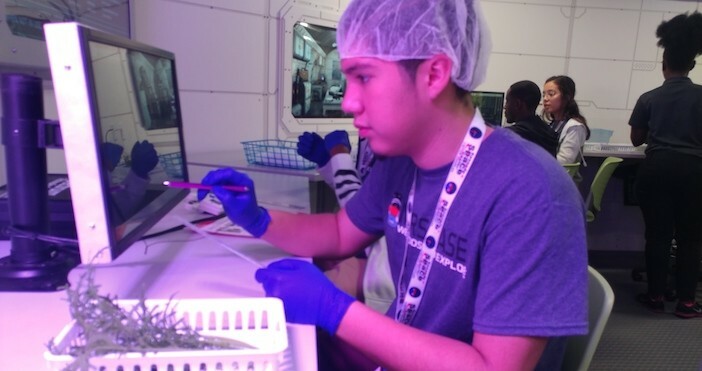 Students get first-hand experience with how food is grown, packaged and sent to space. Students perform a simulation of being on the moon and also code a robot to remove sand from panels, a definite highlight of the trip. Students code robots to remove dust from solar panels. We all tour the Kennedy Space Center Visitor Complex and get to see the Atlantis Space Shuttle up close. Students visit the Kennedy Space Shuttle Complex and see Atlantis Space Shuttle up close. Students visit the Florida Institute of Technology Aviation, where they perform simulations of landing a plane. They also simulate landing a plane in high winds, which is hard! Students sit in actual planes and hear from pilots on their careers and how they got to where they are today. Students get the pilot experience by sitting in airplanes and checking out the controls. Finally, we board the charter plane and fly back in Dallas, both exhausted and thrilled from a trip we will never forget. The students in Florida on the last of their trip.